I wasn’t expecting this plot line. I thought it would just be a more generic expat story and what attracted me was its setting – Morocco. Instead it has echoes of The Talented Mr Ripley, an obsessive friendship told in alternating viewpoints. Dark and twisted, this book was a bit uneven and I wish the women were more distinguishable and the Morocco setting utilized more. Still, a decent read. .
Having read two Higashino books in these recent months, I cannot help but marvel at how he keeps the reader, well, reading. Especially with a detective/crime story that is so quiet and relatively uneventful compared to many others out there which are more action packed. That makes it sound like nothing happens in this book but that is not true. There is a death. A man is dead, poisoned by arsenous acid, likely something he drank in his coffee. A woman, his wife’s employee, is the one who found him. His wife Ayane is the main suspect – her husband had told her that he was leaving her for another woman – but she was hundreds of miles away at the time. What about Hiromi, the one who found him? It’s a locked-room mystery and Tokyo Police Detective Kusanagi is on the case. But he is smitten with Ayane, and unable to believe that she has anything to do with her husband’s death. His assistant, Kaoru Utsumi, believes otherwise. And so, she seeks the help of Professor Manabu Yukawa, a physicist whom Kusanagi often ropes in to help out, except now the two of them seem to have had a bit of a quarrel. It’s one of those crime stories where possibilities are tossed around, then shot down. Compared to other crime cases, this one seems rather simple. A man poisoned. And you pretty much know who did it, but the how is really just something you try to puzzle out, along with the detectives on the case. Salvation of a Saint is a far quieter story than the last Higashino I read, Under the Midnight Sun. But I enjoyed it for its intriguing details, its puzzle of a crime and the way Higashino’s ‘villains’ are often themselves victims. The thing with reading translated works is having to wait for translations to emerge from publishers. This series with Kusanagi and Yukawa is known as the Detective Galileo series. The Devotion of Suspect X (a very good read) is the first in the series, Salvation of a Saint is the second. The third book, A Midsummer’s Equation, (published in 2011) was just released in English earlier this year. It is really confusing! The Devotion of Suspect X is book 3 in the series, but Salvation of a Saint is book 5, A Midsummer’s Equation is book 6. At least according to Goodreads. But when I check Wikipedia I realize that some of the books are classified as short stories, so book 4 (which I now guess to be in terms of publishing order) is a short story, so perhaps that is why the English language publishers decided to skip it? Confused! Also, disappointed! I would love to read his short stories too. Higashino also has another series called the Detective Kaga series, but so far only one of those has been translated into English, called Malice. And once again, the English language publisher has picked a book in the middle of the series, in publishing order, this is book number 4. As I cannot read Japanese, I am at the mercy of publishers who would be willing to have his work translated! He was the star of Attica Locke’s intense Black Water Rising, published in 2009. But I didn’t know Jay Porter until I signed up for this Pleasantville tour. I just jumped onto the tour bandwagon because I saw Attica Locke’s name and decided, yes, I have to get on this tour. Because her Cutting Season was a great read. Not an easy read. But it was a little dark and twisty and as a result quite intriguing. I didn’t know that Pleasantville takes place fifteen years after Black Water Rising. You don’t necessarily have to read Black Water Rising before Pleasantville although I would highly recommend it. It took me just a few days to read Black Water Rising. It startled me with its intensity and its complexity. And I couldn’t wait to read Pleasantville – or really, anything else by Attica Locke! In this sophisticated thriller, lawyer Jay Porter, hero of Attica Locke’s bestseller Black Water Rising, returns to fight one last case, only to become embroiled once again in a dangerous game of shadowy politics and a witness to how far those in power are willing to go to win. Fifteen years after the events of Black Water Rising, Jay Porter is struggling to cope with catastrophic changes in his personal life and the disintegration of his environmental law practice. His victory against Cole Oil is still the crown jewel of his career, even if he hasn’t yet seen a dime thanks to appeals. But time has taken its toll. Tired and restless, he’s ready to quit. When a girl goes missing on Election Night, 1996, in the neighborhood of Pleasantville—a hamlet for upwardly mobile blacks on the north side of Houston—Jay, a single father, is deeply disturbed. He’s been representing Pleasantville in the wake of a chemical fire, and the case is dragging on, raising doubts about his ability. The missing girl was a volunteer for one of the local mayoral candidates, and her disappearance complicates an already heated campaign. When the nephew of one of the candidates, a Pleasantville local, is arrested, Jay reluctantly finds himself serving as a defense attorney. With a man’s life and his own reputation on the line, Jay is about to try his first murder in a case that will also put an electoral process on trial, exposing the dark side of power and those determined to keep it. It is marketed as a thriller and it is indeed, thrilling. And like Black Water Rising, there is far more to the story than just the murder. There are high stakes here, not just because a young girl has been killed, but because of who has been accused of her murder. There is much manipulation going on, deep and dark family secrets, money under the table, skeletons in the closet, and not to mention all that politicking. Jay is reluctant to be a part of this at first, he is recently widowed and struggling to raise his children. But he reluctantly steps into the courtroom, becomes entangled in this major mess and finds a target on his back. 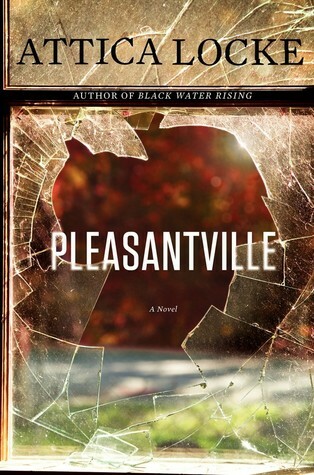 When I finished Black Water Rising and started on Pleasantville, there was a big part of me that was hoping for things to have gone well for Jay Porter. I had felt very invested in his life after finishing the first book and just wanted the best for him. I’m sure I’m not the only reader who feels that way about characters! So it was a little sad to learn that things aren’t going so well for him. But I like how Locke doesn’t just give in to her characters – or her readers. It’s not about “and they lived happily ever after” here. This is life, and life is hard. Locke is truly a master at weaving an intriguing web of murder-mystery, the campaign drama of local politics, social commentary, community and more into an intelligent, complex story. It is an intense read, but wonderfully so. 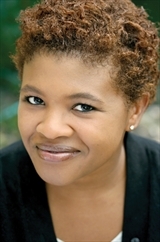 Attica Locke is the author of the widely acclaimed debut novel Black Water Rising, which was nominated for a Los Angeles Times Book Prize, an Edgar Award, and an NAACP Image Award, and was shortlisted for the UK’s Orange Prize. She lives in Los Angeles with her husband and daughter. Find out more about Attica at her website, and connect with her on Facebook and Twitter. It’s always a bit odd reviewing a book in a series. Do I talk about the series expecting any blog readers out there to know about the characters and their background? Or do I have to begin at the beginning? Good thing I actually have a post about the first Maisie Dobbs book, right here! So I can cheat a little bit. 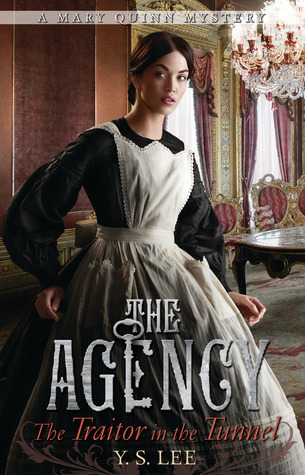 – this book is set in 1930s London. Pardonable Lies is the third book in the series. And Maisie has not one but three mysteries to uncover. Two men lost at war. One young girl accused of murder. How will she manage? To make things worse, there seems to be someone following her and trying to kill her! That always makes things exciting. And it is interesting to see how Winspear is developing her character – as well as bits about the other side characters that feature in Maisie’s life. Winspear has a good eye for details and setting the scene when it comes to 1930s London. Often it is subtle, the street scenes, the clothes Maisie wears, little details like bandages and newfangled technology like long-distance phone calls! I mean, how did detectives or the police manage then without recording devices? But while I was reading this book, I had another on my mind that I was also reading (why yes, I always have several different books going at once – do you?). A different crime series, involving a rather precocious youth. I know it’s unfair to compare Maisie Dobbs to Flavia de Luce. Flavia is young – a child really although if she heard me say that she would likely slip some poison into my next cup of tea or something more devious like eye drops. But she is so much fun to read about, and I feel like she’s become a good (imaginary) friend of mine. The Flavia de Luce series is one that I never hesitate to jump on, grab hold off and lose myself in. And Maisie, well, compared to Flavia, there is an aloofness. Her work is her life. Sure the work might be exciting, thrilling even, but when she’s not working, I’m not all that sure who she is sometimes. Again, as I mentioned, it’s not entirely fair. I’ve read seven Flavia books and just three Maisie Dobbs. So I’m still in the process of getting to know Maisie Dobbs. One of the best things about reading a book like this is beginning to understand how life must have been like as a woman in those times, a single woman, a career woman, a woman who has come up in the world and risen above her ranks. It has such wonderful historical details of life during that time that the less-than-stellar plot resolution is easily forgiven. Hopefully the later books in the series – there are seven more for a total of ten books – will give me a better complete picture of Maisie Dobbs! Pardonable Lies is a well-researched, atmospheric, fun read. 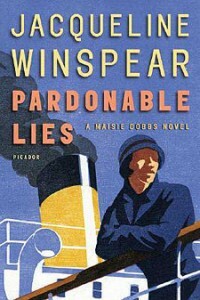 I would encourage those who are interested in historical fiction and less traditional mystery series to give Maisie Dobbs a try. 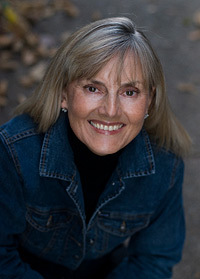 Jacqueline Winspear is the author of the New York Times bestsellers Leaving Everything Most Loved, Elegy for Eddie, A Lesson in Secrets, The Mapping of Love and Death, Among the Mad, and An Incomplete Revenge, as well as four other national bestselling Maisie Dobbs novels. 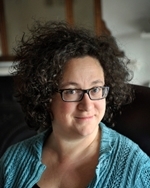 Her standalone novel, The Care and Management of Lies, was also a New York Times bestseller. She has won numerous awards for her work, including the Agatha, Alex, and Macavity awards for the first book in the series, Maisie Dobbs, which was also nominated for the Edgar Award for Best Novel and was a New York Times Notable Book. I first knew of Hercule Poirot from David Suchet’s portrayal of the Belgian detective with that snappy mustache. I think it was my Mum who enjoyed watching this series, well, whatever the reason, I remember watching some episodes as a kid. And here I should add that for many years I (silly me!) scoffed at Agatha Christie and other mystery writers and never went anywhere near the ‘Mystery’ sections in libraries or bookstores at all. I have since learnt what a fool I’ve been! Today I read far more widely than I used to, thanks in part to all you wonderful book bloggers out there! And have been poking around quite a few mystery/crime/detective series, and not just liking but loving them! Among those I’ve enjoyed are Laurie R King’s Mary Russell and Kate Martinelli series, Alan Bradley’s Flavia de Luce series, Colin Cotterill’s Dr Siri Paiboun series, Jacqueline Winspear’s Maisie Dobbs series. In the past couple of years, I’ve even read Sherlock Holmes! This was largely due to the excellent BBC series. And that was a huge step for me, as my sister and I were given a collection of Sherlock Holmes stories when we were kids and that book was nothing more than a bookend to us! But yes, Agatha Christie. She of the 66 detective novels, of which 33 star Hercule Poirot. Of which I have perhaps read four? I hope to slowly increase that number, because they are a delight to read. 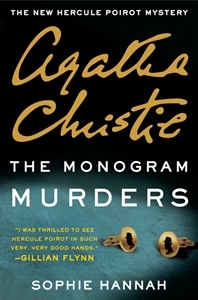 But this one, this latest Hercule Poirot mystery, is written by crime novelist Sophie Hannah, who, in an interview with The Telegraph, said that she decided to construct “the most intriguing possible mystery and bring it to Hercule Poirot”. “Hercule Poirot’s quiet supper in a London coffeehouse is interrupted when a young woman confides to him that she is about to be murdered. She is terrified – but begs Poirot not to find and punish her killer. Once she is dead, she insists, justice will have been done. And while I’m not as familiar with Poirot as others may be, but not long after finishing The Monogram Murders, I read Evil Under the Sun (Hercule Poirot #23), which I selected at random to get a better feel for Christie’s Poiroy, and it feels like Hannah has captured his mannerisms well. However, after reading Evil Under the Sun, Monogram Murders felt too lengthy, so I checked Goodreads: At 352 pages (hardcover version), The Monogram Murders is longer than many of Christie’s books, which seem to have fewer than 300 pages. For instance, Evil Under the Sun is 220 pages long. What is with all these book lengths these days? The book felt like it went on too long here and there, especially after I read Evil Under the Sun which seemed more crisp and efficient. Still the mystery was rather an enjoyable one, a tricky one that Christie herself might have thought of (please don’t yell at me for saying that, any Agatha Christie fans out there!). I’m still a rookie when it comes to this genre so I’m going to have to study up by reading more by Sophie Hannah and Agatha Christie – and whatever other crime/mystery/detective/thriller series/novels that you would recommend. I have to be honest, I was all ready to settle down for an, erm, unsettling mystery with this book. Instead I found myself immersed in an intriguing story with such depth and history that it took me a while to emerge from this. And even longer to figure out how to write about it. “Still, she took it as a sign. 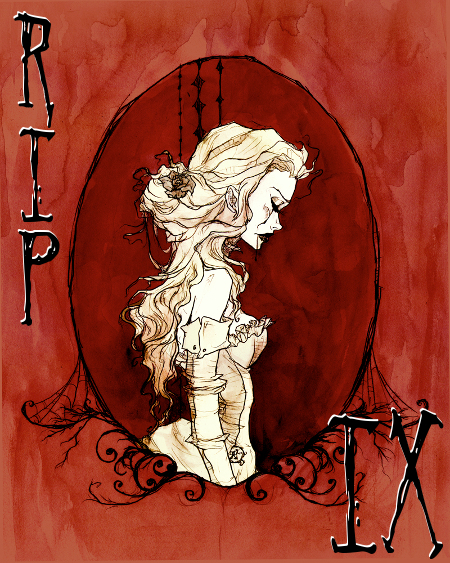 A reminder, really, that Belle Vie, its beauty, was not to be trusted. Caren Grey is the general manager of Louisiana plantation-turned-tourist attraction Belle Vie. They host weddings and dinners, school tours and your usual tourists, enticing with some lovely 18-acres of views, a 157-year-old building, hearty food (“grits, rolled with smoked Gouda, spinach, and bacon; chard out of the garden, with garlic and lemon; and potatoes creamed with butter and drippings”), and a play by the Belle Vie Players about the plantation’s history. Caren’s job is to make sure things run smoothly. With an almost-degree (she never quite finished) from Tulane Law School, some might say she’s overqualified for the job, but with a young daughter, it’s the best she can do at the moment. Plus she has ties to the place. Her mother used to cook for the family who lived there, but Caren’s roots go even deeper than that – she is the great-great-granddaughter of slaves who worked the plantation. Her usual morning rounds come to an abrupt halt when a body is discovered on the property. A female migrant worker, her throat cut, her body buried in a shallow grave on the edge of the property, near the sugarcane fields owned by a burgeoning corporation. The sheriff’s department thinks they have their man. But Caren thinks otherwise. And sets about trying to put things right. She has her own reasons though – her daughter Morgan, just 9, is keeping something from her, and that something involves a blood stain on the sleeve of one of her school shirts. And more importantly, Caren and Morgan reside on the property, and it is disconcerting to know that there is a killer out there somewhere. As if the plantation weren’t already eerie enough, with its leaden grey fog and rumours of being haunted. Locke effectively uses the murder mystery to frame some bigger issues – race relations, politics, modern-day slavery, corporations etc. It was interesting to see how the Belle Vie Players, caught up in telling their tale of slavery on the plantation years ago, fail to see the similar situation that the migrant workers face working the sugarcane fields next door. And Locke has given us a character whose roots are firmly in reality. Her emotions are raw, her actions flawed, but Caren is a tough character to like. Given her background as a former law student, some of her actions were questionable, but as a mother intending the best for her child, understandable. 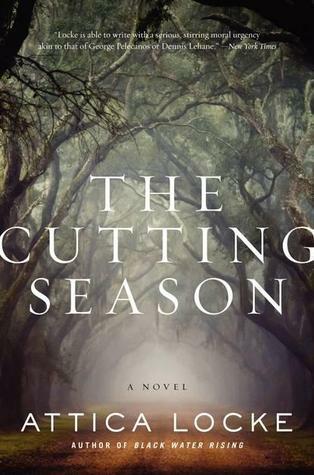 The Cutting Season is an absorbing, well-written, atmospheric read, right from its opening when a snake as long as a Cadillac falls out of a tree and onto a woman’s lap to the way Locke ends it, staying away from conclusions that are too perfect and too neat but thoroughly satisfying. I can’t wait to read more by Locke – I’ve just requested Black Water Rising from my library. Attica Locke is the author of the widely acclaimed debut novel Black Water Rising, which was nominated for a Los Angeles Times Book Prize, an Edgar Award, and an NAACP Image Award, and was short-listed for the UK’s Orange Prize. She lives in Los Angeles with her husband and daughter. Find out more about Attica at her website, connect with her on Facebook, and follow her on Twitter.